We pride ourselves on quality workmanship and responsive customer service. 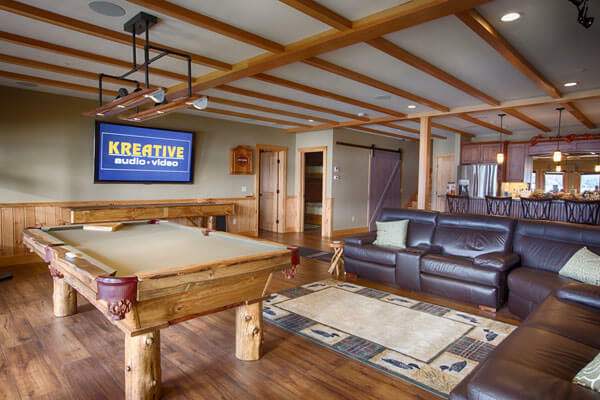 Whether installing a flat panel TV, whole house music system, lighting control, or full home automation system, our involvement continues even after the completion of your project. From basic 5.1 surround sound system to a 7.2 home theater we use the right components to transport you to the movie theater with real cinema sound and professional theater quality audio. We offer networking services for home and small businesses. Whether you need a simple wired or wireless network for your home or office to share printers and Internet access or a more robust wireless network to even cover the outdoors, we will have you covered. Want to listen to your favorite music no matter where you are in the house? Or perhaps you want to listen to your music in one room while someone else listens to something else in a different room? No problem. We can design a system to fit your needs. Imagine you are sitting on the couch and you want to dim the lights. All you have to do is grab your remote, iPhone, iPad, or Smart Phone and with the simple push of a button the lights will dim to your preference. You can control one room or multiple rooms or even the whole house. Your options are endless. A smart house is a house that has highly advanced automatic systems for lighting, temperature control, multi-media, security, window and door operations, and many other functions. Create the perfect movie ambiance with the touch of a button. Control your thermostat wherever you are in the world. Manage music in multiple rooms. Get a text message when someone comes home.